Pear and Apple Chips are the perfect party chip for a fall evening! I served these for a wedding and they were eaten up in no time flat! Congratulate me. I finally got around to posting one of the wedding recipes from the beginning of October! Woo hoo! I'm only a month late! And speaking of late, ya know what is truly sad? Missing the Ms. Punkin Chunkin pageant because the traffic for parking delayed us two whole hours (during which many men walked into the surrounded trees to use the facilities....they needed to walk about ten feet farther in), and then we got stuck in the mud and pulled out by a nice man in a John Deere, got stuck in the mud one more time....then finally made it into a parking spot. No joke! But still! So not fair! This was my year! I was gonna take the crown! For those of you who are just now realizing my adoration for some of life's funnier moments: Yes, there is a festival called Punkin Chunkin filled with flannel and pumpkins and yes, they hold a beauty pageant that I was registered to compete in. "It all started back in 1986," said Ellsworth. "We were playing around one day and somebody started talking about throwing pumpkins. There had been an article in a newspaper or on television about some people throwing pumpkins at Salisbury State. A physics class or something. One of us said that they could throw further than someone else and I threw my hat on the ground." That was the challenge that started it all. This isn't a competition for the faint of heart. They draw crowds up to 20,000, and if you can't handle being crowded in by 20,000 people all wearing flannel and beer hats in the shape of a pumpkin...this just isn't for you. But there is funnel cake. So it's a bit of a toss up (bad pun). Jamie Hyneman of the Mythbusters came, interviewed many of the teams for the Discovery Channels coverage of the event that you can see on Thanksgiving. Which really might be the way to go, all the chunkin and none of the blaring country music, kegs, flannel, pumpkin hats, tailgating......who am I kidding. That's totally the best part. People come and camp for a few days and just have a blast, with couches in the back of a pick up truck watchin' as the pumpkins fly, catapults collapse, and the occasional failed exploding pumpkin. 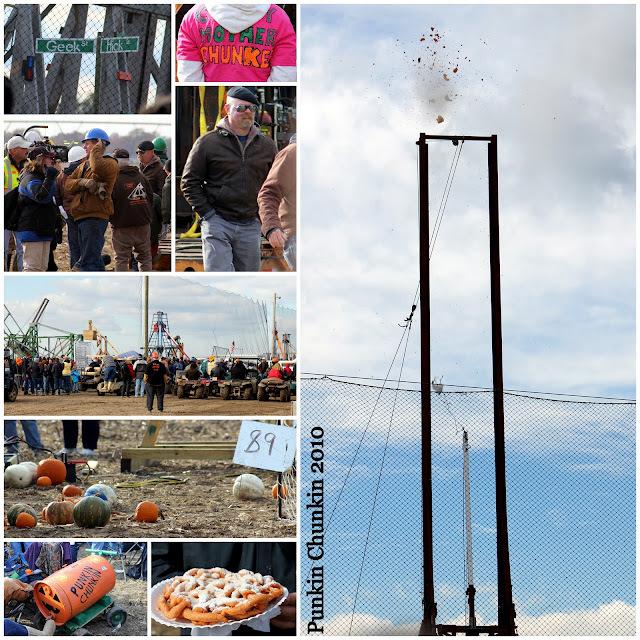 Left collumn: the adress, a proud mother of a contestant, Jamie Hyneman shooting, droves of catapaults and quads, perfectly round pumpkins, a punkin chunkin beer container, and of course pumpkin funnel cake! Right side: FAIL! I try to go every year....because really, red neck beauty pageants and pumpkin tossing is just about the funniest thing I can think of. I know you're jealous. First weekend in November head to Bridgeville, Delaware. Plan on it next year! But if pumpkin isn't your thing, these apple and pear chips will be! In a small pot, combine the water and sugar and bring to a gentle boil over medium heat. Set aside to cool. Using a mandoline or sharp knife, cut each one into rounds about 1/8 of an inch thick. Remove any seeds as you cut and submerge the apples slices in the syrup and allow them to sit for at least four hours, completely covered by syrup, in the refrigerator. Bake in the oven until crispy, about 1 hour. Apples and pears will crisp further as they cool.